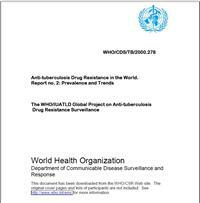 This report gives the results of the Global Project on Anti-Tuberculosis Drug Resistance Surveillance (DRS), conducted between 1996 and 1999, three years after the initial survey of 35 geographical settings, with the aim of collecting worldwide information on drug resistance of Mycobacterium TB. The report includes the following data: (1) information collected in the period 1996-1999 on the prevalence of drug resistance from 58 geographical settings; (2) trends on drug resistance from 28 geographical settings; (3) data from 17 geographical settings on the levels of drug resistance according to place of birth; (4) individual patient data from 11 geographical settings to assess determinants of drug resistance; (5) and ecological data from all 72 geographical settings that participated in the Global Project since 1994. The report discusses the project's background and methodology and provides statistical results and a discussion of the findings. The findings describe the magnitude of anti-TB drug resistance; the relationship between drug resistance and TB control indicators; the impact of migration on drug resistance; and the impact of age, HIV, and prior TB treatment on the magnitude of drug resistance. Data confirm that prior anti-TB therapy is a strong predictor of drug resistance. The report also includes copies of the forms used in data collection and individual country profiles. 252 p.: b&w, ill.; appendices, graphs, refs., tables.